This April 28, 2017 photo shows cacao pods at Raaka Chocolate in the Red Hook section of Brooklyn, New York. 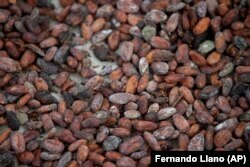 The researchers found evidence of cacao’s use at an ancient village in the highlands of southeastern Ecuador. They examined the remains of very old objects at the Santa Ana-La Florida archeological site. The village was part of the Mayo-Chinchipe culture of the Andes. Cameron McNeil is a professor at Lehman College in New York. She is editor of the book “Chocolate in Mesoamerica.” She told the Associated Press that Santa Ana-La Florida is “the earliest site now with domesticated cacao.” McNeil was not involved in the new research. “They clearly drank it,” Blake told the Reuters news service. 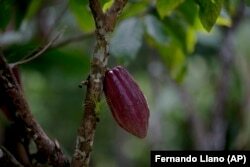 In this April 16, 2015 photo, a cacao pod hangs from a tree at the Agropampatar chocolate farm co-op in El Clavo, Venezuela. Archeological evidence suggests cacao domestication moved into Central America and Mexico about 4,000 years ago. It is not clear how cacao’s use spread between South and Central America. We want to hear from you. What other special foods do you think people have been using for much longer than we know? Write to us in the Comments Section or on our Facebook page.